WASHINGTON — President Trump threatened on Monday to strip the security clearances of top former officials who criticized his refusal to confront Russia over its election interference, signaling a willingness to use the powers of the presidency to retaliate against some of his most outspoken detractors. Among those who could lose access are John O. Brennan, the former C.I.A. director; James B. Comey, fired by Mr. Trump as F.B.I. director last year; and James R. Clapper Jr., the former director of national intelligence, said Sarah Huckabee Sanders, the White House press secretary. The suggestion marked an unusual politicization of the security clearance process by a president who has routinely questioned the loyalties of national security and law enforcement officials and dismissed some of their findings — particularly the conclusion that Moscow intervened in the 2016 election — as attacks against him. Mr. Trump’s plan to review their clearances appeared to be an off-the-cuff idea — announced just after Senator Rand Paul, Republican of Kentucky, suggested it to him — rather than a carefully considered proposal. Two of the targets Ms. Sanders cited, Mr. Comey and Andrew G. McCabe, who was fired in March as deputy director of the F.B.I., no longer have security clearances. Former high-ranking officials in defense, intelligence, diplomacy and law enforcement usually maintain their clearances to advise those still in government, former officials said. A clearance also serves a more personally profitable function: helping departing officials get jobs at security contractors or similar firms. Mr. Trump’s threat appeared designed to rebuke high-profile critics whose titles, experience and access to the nation’s most sensitive secrets lend weight to their arguments. “It is intended to punish and intimidate his critics and is shameful,” said Jeffrey H. Smith, a former general counsel for the C.I.A. He compared it to the so-called red scare of the 1950s, when J. Robert Oppenheimer, the physicist who helped develop the atomic bomb, had his security clearance revoked because of fears over his associations with Communists. But the president has wide latitude on clearances, and courts are reluctant to overrule presidents on national security matters, Mr. Smith said, so there is probably little the former officials can do to block the move if the White House moves forward. Another former official being targeted, Michael V. Hayden, the former head of the C.I.A. and National Security Agency during the George W. Bush administration and a principal at the Chertoff Group who just wrote a book, said the removal of his security clearance would not affect “what I say or write.” He added on Twitter that he does not go to the White House for classified briefings. Ms. Sanders said Mr. Trump was also considering whether to strip the clearance of Susan E. Rice, Mr. Obama’s national security adviser. As unusual as the suggestion was, it reflected an equally remarkable dynamic that has taken hold in the Trump era: the fact that so many former senior intelligence officials are willing to regularly criticize the sitting president in public. Senior intelligence officials generally consider themselves, and the information they provide, nonpartisan. During past administrations, they have attempted to maintain an apolitical posture once they left the government, limiting their public criticism of successors. But Mr. Trump has routinely attacked intelligence agencies, portraying them as part of a so-called deep state, an unelected cabal seeking to steer United States policy and undercut him. Last year after a meeting with Mr. Putin, Mr. Trump called Mr. Brennan, Mr. Clapper and Mr. Comey “political hacks” as he cast doubt on Russia’s interference. After Mr. Trump again stood alongside President Vladimir V. Putin of Russia in Finland last week and sided with him over the intelligence community to cast doubt about the campaign meddling, the trio renewed their denunciations. Mr. Brennan, a fellow at Fordham Law School who is under contract as an analyst with NBC, called Mr. Trump’s performance “treasonous” and said it warranted impeachment. Mr. Comey, whose best-selling book portrays the president as a liar, tweeted that he “sold out our nation on an international stage.” Mr. Clapper, who serves on the advisory board of the Committee to Investigate Russia, a group co-founded by the Hollywood director Rob Reiner, mused aloud about “whether the Russians have something” on Mr. Trump. Ms. Sanders cited their censures on Monday, though her threat also served to extend public scrutiny over Mr. Trump’s wavering in Finland about Russia’s election hacking. Ms. Sanders’ announcement came hours after Mr. Paul said he would raise the prospect of revoking Mr. Brennan’s security clearance in a meeting at the White House with Mr. Trump. Following their conversation on Monday afternoon, Mr. Paul said in a post on Twitter that he had told the president “what I have said in public: John Brennan and others partisans should have their security clearances revoked.” He said that public servants should not use security clearances to leverage speaking fees or paid cable-news appearances. 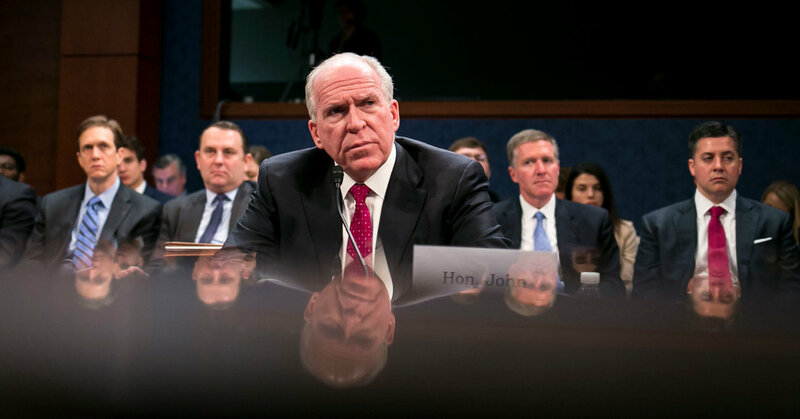 Mr. Brennan “hasn’t made one penny off of his clearance,” said Nick Shapiro, the former deputy chief of staff at the Central Intelligence Agency, adding that none of Mr. Brennan’s jobs since leaving government was contingent upon his access to classified information. Traditionally, former senior national security advisers and intelligence chiefs retain their clearances, so they can consult and advise their successors. But former officials said that in the case of the six singled out by the White House, the president’s animosity makes it next to impossible to continue working with their former agencies. The most senior officials, people who have led the C.I.A., the National Security Council or the Office of the Director of National Intelligence, offer future employers their reputation and long experience, rather than access to current classified briefings, former officials said. Security clearances are far more important for former midlevel officials joining the private sector, though they do matter to some who served in senior ranks. Before briefly joining the Trump administration, for example, retired Lt. Gen. Michael Flynn, the former head of the Defense Intelligence Agency, used his security clearance to help built up a lucrative consulting and lobbying business for clients like the government of Turkey. Administrations do typically cut off officials from previous presidencies from briefings, other former officials said. The Obama administration, for example, was hesitant to work with George Tenet, the former C.I.A. director, or Paul Wolfowitz, the former deputy defense secretary, because of their roles in the Iraq war, said James Lewis, a senior vice president at the Center for Strategic and International Studies and former foreign service officer. But security clearances are generally revoked only for wrongdoing, he said. Reporting was contributed by Eric Schmitt, Mark Mazzetti, Matthew Rosenberg and Michael S. Schmidt. October 1, 2018 Comments Off on Biden Is Preparing for 2020. Can He Overcome the Hill-Thomas Hearings?